SPICEBUSH Lindera benzoin (L.) Blume 15 October 2013, Stroud Preserve, West Chester, Chester County, Pennsylvania. Today the Stroud Preserve had the look of fall and the feel of summer, as it was quite warm and nearly windless. Bird life was listless, which could have been a factor of my late start. There seemed to be far more butterflies flying about than birds. The bird of the day was a gianormous dobsonfly that flew past nearly taking off my head near the old farm pond. Judging from the size of it’s mandibles, which seemed to be half of the total length of the insect, I would guess that it was a male. I remember seeing many of these growing up South Carolina, but this is one of the few that I have seen in Southeastern Pennsylvania. Now that I have a fairly good grip on the birds and plants of the Stroud Preserve I think the project that I would like to undertake next year is to start an inventory of butterflies. I have a fairly large insect collection that I primarily use for educational purposes. I have only one tray of butterflies and I would like to keep it that way for two reasons, the first is that butterflies take up lots of room in Cornell trays and that gets expensive as time goes on. The second reason is that I don’t really enjoy pinning butterflies. If I forgo collecting butterflies specimens I’ll need to get a good camera so that I can document what is there. Good camera is something I’ll have to save for. So until that happens, I’ll stick to plants and birds. SPICEBUSH Lindera benzoin (L.) Blume 11 April 2013, Stroud Preserve, West Chester, Chester County, Pennsylvania. Speaking of plants, the photo above is the fruit from a spicebush (Lindera benzoin). These little red berries, actually a drupe, have been a long time in coming as the flowers of the spicebush (right) are amongst the first flowers to be seen in the spring, flowering far in advance of the leaves. Spicebush along with several species of viburnum are amongst the most dominant of the native shrubs of the forest understory here in Southeastern PA. Here I emphasize “native” as the non-native honeysuckles, privet, and autumn-olive far out number the native shrubs. 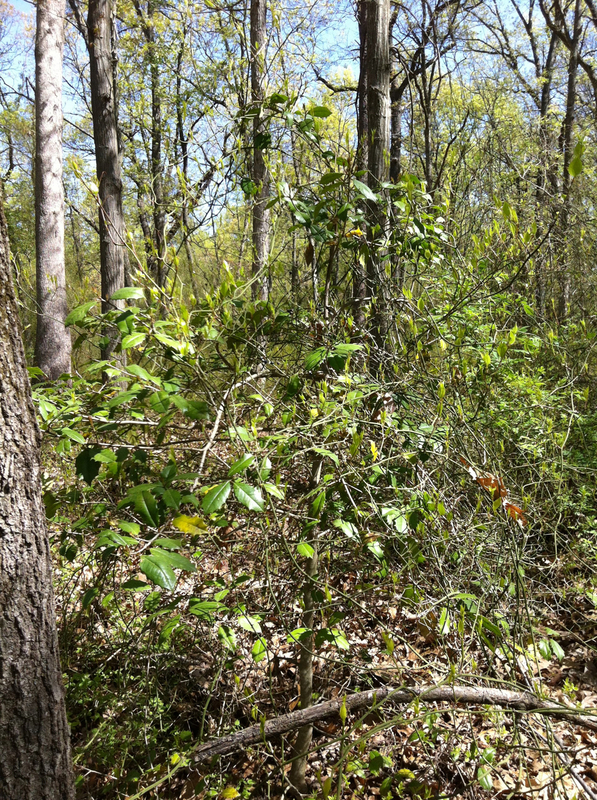 It is one of only two members of the Laurel family that occur in Pennsylvania, the other being sassafras (Sassafras albidum). Sassafras is quite common in most parts of Chester County, but locally on the Stroud Preserve, it seems to be few and far between. On Sunday I saw a report on PABIRDS of a Nelson's Sparrow at Exton Park, in Exton of all places. Having never been there and seeing that it was only about 4.5 miles I thought I'd go check it out. Nelson's Sparrow is a species that I haven't seen since in a long time and it has been on my list of birds that I'd like to find at the Stroud Preserve. I didn't have much time to explore the 700 acre park, but I did find the spot where the sparrow was seen the day before. There were many Swamp, Song and White-throated Sparrows, a handful of Lincoln's Sparrows and a single Field Sparrow. I could not find a Nelson's Sparrow anywhere. Otherwise, I enjoyed my walk around the pond. Other highlights were a Merlin and an adult Bald Eagle and my first fall Yellow-bellied Sapsucker. I heard but did not see a Greater Yellowlegs. The full list of birds is below. Greater Yellowlegs – 1, heard only. Crow sp. – approximately 50. There were many crows but only calling in the proportions noted above. Yellow-rumped Warbler – approximately 100. The trees around the pond and wetlands were filled with these. It has been quite a while since the last time I posted anything about birds at the Stroud Preserve. This is primarily due to the fact that I have not been birding there in quite a while. I spent much of the summer working on plants there. During much of the breeding season, my birding efforts were searching for birds that I thought might be here but couldn’t find, primarily woodland species like Hooded, Kentucky, Worm-eating and Prothonotary Warblers. I searched what I thought might be appropriate habitat listening and using playback to conclusively determine that they did not occur on the preserve. Looking for and not finding birds generally takes a lot of effort and produces a very boring species list. The other complicating factor that has kept me away from the preserve since the first of August is that I secured a paying job after two years of unemployment. This was and especially difficult tasks because finding something in my career path (wildlife biology and ecology) is particularly difficult in Southeastern Pennsylvania. It is a position with a federal agency which has an intensive job training program in Maryland. So, I’ve been physically away from the area, which in turn, makes it hard to get out birding here. However, after seven weeks of steady work, I got furloughed. Such is life working in the public sector. It’s not the first time that I’ve had to deal with something like this and I’m sure it will not be the last. The upside to being furloughed is that I got to go birding to day at the Stroud Preserve. I was hopeful that the storm front that passed through here yesterday would have brought waves of migrant birds to the east fork of the Brandywine Creek. And to this end, I was disappointed. The up side is that I did tally a new species for the preserve list! There were approximately 15 Dickcissels in the vegetation covering the old pond bed. These were the first Dickcissels that I have seen since returning to the east coast in August of 2011. Other birds that were noteworthy were a pair of Kestrels and a single Merlin. The Kestrels were dive-bombing the Merlin. Once the Merlin was driven off, the Kestrels foraged along the fields on the north side of the preserve where the Bobolinks nest. There were also approximately 25 Snow Geese in two groups, in the first 15 followed by 10 more about 20 minutes later. They were both heading south-southwest. What I didn’t see today were waves of migrant birds; only three warblers totaling 6 individuals. For the most part it was pretty quiet today. I did have stellar views of the Yellow-throated Vireo which is always nice. Since I have been away from the area for the last seven weeks I don’t really have a good grip on whether any of the birds that I saw today are early or late or otherwise. Dickcissel – 15, New bird for the preserve! Approximate number as they were foraging in the vegetation of the old farm pond in a loose flock and were difficult to count. The most I observed at one time were 8. Venus' looking-glass Triodanis perfoliata (L.) Nieuwl. 15 June 2013, Stroud Preserve, West Chester, Chester County, Pennsylvania. Whoa! It’s been a long time since I’ve done a bird post to le blog. Since 10 May to be exact. You might wonder where I’ve been. Well, I’ve been here, I just changed gears a little bit from birds to plants. When I was mostly focused on birds, I could go out birding, then come home write my notes as a blog post, post it and be done with it all in 30 minutes or so. Plants are a different matter. Many plants I know. Most I do not. 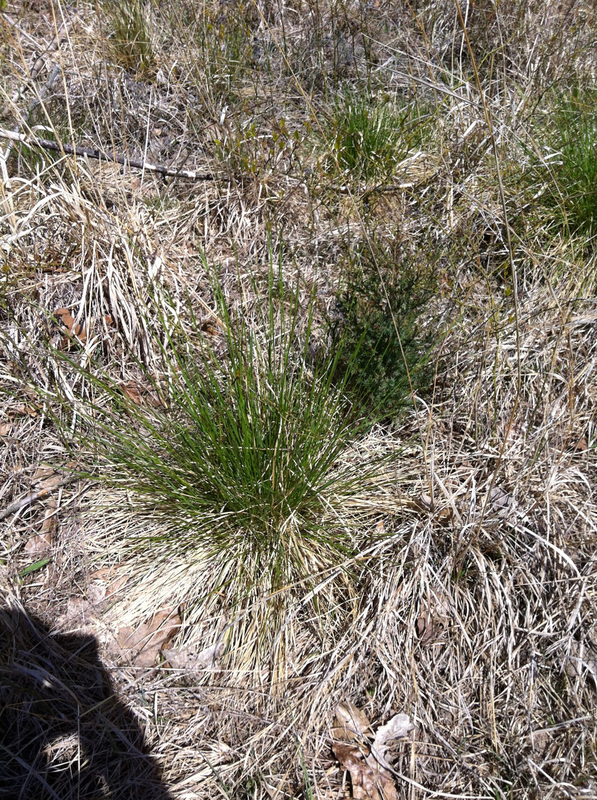 Especially the hard ones, like grasses, sedges, and rushes. Many of these require that I collect a specimen and bring it home and examine it under my microscope. The technical keys are, well, technical. They also employ the botanical lexicon with which I am quite rusty. So, things are slow and I usually go late into the night working on plant identifications. The result is this doesn’t leave much time to blog [case in point, I wrote this post on the 15th and I’m just getting around to posting it!]. The other complication is that my schedule altered slightly and most of my visits have been in the afternoon well past the time good for birds. This was compounded by the fact that my car, a 1994 Honda Passport with 270,000 plus miles, needed some attention from our local mechanic. I’ll spare you from the details of that unpleasantry. The good news for me is that school is out and I no longer have to see the kids off to the bus, which frees up my morning quite a bit. My car is now moving forward again. However, I still try not to drive it and use my bicycle when ever possible. I’ll still be focused on plants but should be able to do at least one breeding season post per week. As far as plants go, feel free to check out my photo albums for each family. I have many hundreds of photos posted at this point. If you see anything that is incorrectly identified, please don’t hesitate to let me know. 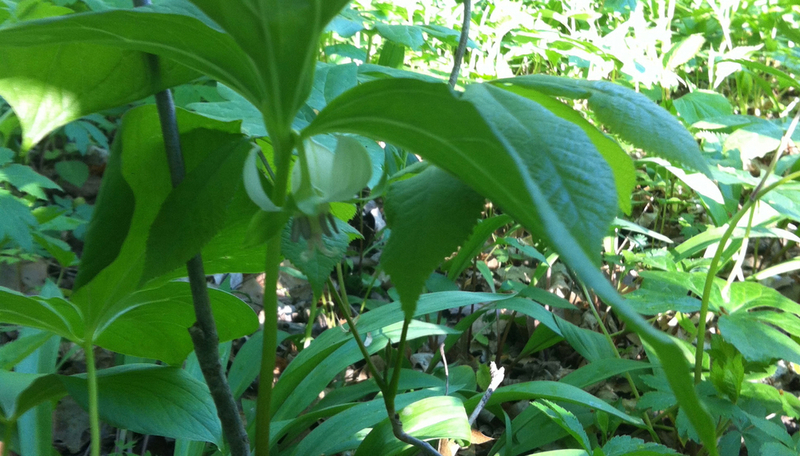 My main focus with the plant project is to inventory all that grows at the Stroud Preserve. You can check out my running list here. As for birds, I did manage to get out on Saturday (15 June 2013). I believe everything on my list below is pretty normal for this time of year. The most exciting thing for me was the many Yellow-billed Cuckoos that I heard and saw. Last summer I did not see or hear any. In fact, I did not record one for the preserve at all until the fall. Even then, I only saw two. On Saturday I saw twice as many as I have ever see or heard in total previously! Here are the rest of the details. I misplaced my notes on the numbers seen today so an X signifies presence. All observations from 15 June unless otherwise noted. Red-tailed Hawk – I haven’t check the nest site on the north side of the preserve since the middle of May. Wild Turkey – heard calling on 19 June on the southwest side of the preserve. Yellow-billed Cuckoo – Up to 6 birds seen or heard. I did not detect this species at all last summer. Barred Owl – a pair calling along the green trail where I suspect they nested. Acadian Flycatcher – A number of birds can be found calling in wooded areas of the preserve. Willow Flycatcher – Many birds calling in open areas with small trees or shrubs. Fish Crow – Not recorded at the preserve, however, numerous birds can be seen in downtown West Chester feeding fledglings. Blue-winged Warbler – Multiple males singing on territory. Bobolink – 15 to 20 birds in the usual nesting area. Eastern Meadowlark – ? I have not been able to check the suspected nesting area because of road construction. Last noted on 10 May. Common Grackle – Strangely difficult to see in the summer months. Very common in other urban areas around West Chester and Exton. Purple cliffbreak Pellaea atropurpurea (L.) Link 9 May 2013, Stroud Preserve, West Chester, Chester County, Pennsylvania. Today I spent the majority of my time focused on plants with preserve manager Fred Gender. I could have probably tallied more birds for the day list if I looked up more often, but I can’t complain about that today. I did manage to get one new bird for the year. Finally, after nineteen months after moving back to the east coast and many hours of fruitless searching I heard, the got extended looks at a Louisiana Waterthrush! The waterthrush was in one of the smaller streams that drain off one of the hillsides in the preserve. Specifically, the stream along the “green” trail (I’ve started calling it green creek). It is probably the best creek in terms of a wooded stream with a completely covered tree canopy. It is perfect place to see a Louisiana Waterthrush. Here is everything else. I didn’t really pay much attention to numbers today so unless otherwise noted and “x” will have to do. Louisiana Waterthrush – 1, FOY, Bird of the Day! Bobolink – 5, as with the past two visit, these birds were not in the usual field but in the larger field on the south side of the preserve. Nodding trillium Trillium cernuum L. 8 May 2013, Stroud Reseve, West Chester, Chester County, Pennsylvania. Finally, a step forward! Not a big step forward, but a step forward nonetheless. I picked up 4 new birds for the year, Barred Owl, Northern Parula, Black-throated Green Warbler, and Ovenbird. I almost decided not to go out as all today because of heavy rain. But my little iPhone app said it would be ending by 10:00 AM. So, I headed out at 10:30 just to be safe. My app lied. There was light rain until about 11:30. I haven’t checked the Eastern Meadowlark spot for a while because of road work that blocks easy access. I decided to make the extra effort to see if the male at the corner of Creek and Strasburg Road was still there. I have yet to see this bird interact with another meadowlark or any other signs of nesting. But, that it is still there lends hope that it will. While the handful of new year-birds was exciting, it was overshadowed with the location of 23 nodding trilliums (Trillium cernuum). I had given up hope of finding any of these as I have checked all of the suitable habitats on the preserve several times. I had high hopes that I would find some at the site from last year but after searching the area I came put empty. However, I did find what I believe is a netted chain fern (Woodwardia areolata). I’m still working on the final confirmation, but if correct, it would be a nice addition to the preserves flora list. Solitary Sandpiper – 1 along the Brandywine. Fish Crow – 4, on the east side of the preserve. Cedar Waxwing – approximately 10, heard only. Northern Parula – 3, FOY, singing along the Brandywine. Bobolink – 3, in first field on the left, as with yesterday, not where I have seen them before. It seems as if migration is going forward for every location other than the Stroud Preserve. Here, it seems to be going backwards. I picked up no new arrivals and only 45 species. That things are slow is not just my imagination. For this day last spring I tallied 75 species. I never go fewer than 60 species for any day in May of 2013. I’m assuming it will get here sometime soon. Until then, there are plants to identify. Just as with birds, plants can throw you a curve by possessing some type of aberrant feature. Above is a bulbous buttercup (Ranunculus bulbosus) with 10 petals. It should have only 5. You know it's a slow day with the highlight is a buttercup with 10 petals. Bobolink – 6, these were flying over and calling from the field in the northwest corner of the preserve where I have never seen them before. I saw none in the traditional nesting area. Wild ginger Asarun canadense L. 1 May 2013, Stroud Preserve, West Chester, Chester County, Pennsylvania. Today I a nice May Day surprise and finally added a long over due Purple Martin to the preserve list. When I first started birding here one of the first things I noticed on the checklist for the preserve was that there were only three swallows listed, Barn, Tree, and Northern Rough-winged. Thinking back to when I lived in southeastern Pennsylvania back in the 1980s I didn’t recall that Bank, Cliff and Purple Martin were all that difficult to come across. When I adopted the preserve as my own little bird and plant project, I predicted that I would add these birds to the list without any trouble. It would just be a matter of looking at all the swallows carefully. I’m happy to say that, as predicted, as of today, I have added the other three swallows to the preserve list, however, not as predicted, it was a lot of trouble! I have spent more time than I’d like to admit sorting through the large groups of swallows that occur here. I had given up hope of seeing them last season then very late in the fall I had a handful of Bank and Cliff Swallow pass over head. Today it was again pretty slow and I had given up on any new spring arrivals. Then literally the last bird I saw as I opened the door to my car was a large, dark swallow with a notched tail. It was not calling or vocalizing at all so I could have easily missed it. I was unable to check on the Eastern Meadowlark today as the bridge on creek road is being worked on and I didn’t have time to walk to the area. I also did not see any Bobolinks either. I walked all the way around the nesting area and didn’t see or hear any. For the third day in a row, there was a Solitary Sandpiper in the east end (the drainage end) of the old farm pond. Purple Martin – 1, adult male FOY, first for the preserve. Jack-in-the-pulpit Arisaema dracontium (L.) Schott 30 April 2013, Stroud Preserve, West Chester, Chester County, Pennsylvania. Today’s walk yielded no new year-birds and my species count was lower than yesterday’s, however, it was not raining and that is a winner in my books! With the exception of swallows and swifts chattering overhead, it was largely silent. I heard a Eastern Meadowlark on the west side of the preserve, but I think it is more likely a transient. Plants are blooming at an exponential rate. I think I have over two hundred species on the plant list so far which includes very few trees. Rushes, sedges and grasses are starting to bloom so I am spending much more time in the evening with my microscope trying to figure those things out. They ain’t easy! Pictured above is an easy one. Solitary Sandpiper – 1, in the old farm bed. Eastern Meadowlark – 2, 1 calling from field on west side of preserve, 1 calling from usual spot on Creek and Strasburg Roads. Rue Anemone Thalictrum thalictroides (L.) A.J.Eames & B.Boivin 29 April 2013, Stroud Preserve, Chester County, Pennsylvania. When I got up this morning it was raining. I looked at the hourly forecast and looked as if the rain might disappear until the afternoon. So, I took my chances and headed out the door. As it turns out, my chances were not good and it rained constantly the entire time I was out. But, at least I got out. I decided it would be a good day to visit the Susan Groome Harney part of the preserve to see what kind of plants might be found there. It is on the very north end disjunct from the rest of the preserve. As it turns out the plant community, at least the understory, is quite different from what I have seen in other parts of the preserve. A few weeks ago I mentioned that I had only found species of mustard, Cardamine concaternata, in only a few small places. This area was covered with it. In all, I found over ten new species of flowering plants that I have not recorded before. I suspect that the soil type might be a little different there. It will be interesting to see what else pops up over the summer. I spent most of my morning looking for plants but I did venture back to the main part of the preserve to go see if the Bobolinks were back. I spent about 45 minutes walking at a brisk pace through the rain and found the Bobolinks were indeed back. I also saw my first of year Blue-winged Warbler, Gray Catbird and Solitary Sandpiper. I also saw my first fledglings of the year as a pair of Canada Geese were leading around 6 downy chicks. It was also my first confirmation of them breeding on the preserve. What was most surprising was that in my brisk walk through the constant rain, I tallied my highest daily species count for the year at 58! I’m still looking for that breakthrough spring day were birds are everywhere! American Robin – approximately 10, two nests observed with female incubating. Cedar Waxwing – approximately 25, one flock overhead, first observation since 14 January 2013. Blue-winged Warbler – 1, FOY, right where Kelly said it was. Accompanying me on my walk today was Susan Charkes. We had high hopes for more spring birds but our hopes didn’t produce anything new. As we were lamenting about the lack of birds we ran into Kelly Nunn, who was not lamenting about the lack of birds. She had quite a list of birds that we had not seen including Blue-winged Warbler, Baltimore Oriole and Orchard Oriole. Kelly did start about an hour earlier than we did but I still can’t help but think that I did something to offend the spring warbler. I seem to be little behind what is generally being reported. The birds never did really pick up for us, but fortunately, springtime has other things to offer. While the photo above could reflect my grumpy disposition about the state of migration, it is actually a snapping turtle that I see frequently hauled out on a stream bank on the northwest side of the old farm pond. It usually on the side that is to squishy for me to walk on but today, it was on the opposite side, where I could take a nice portrait of it. Susan and I worked our way around to the serpentine outcrop to look at the interesting plants in bloom there. Lyre-leaved rockcress (Arabis lyrata), large field mouse-eared chickweed (Cerastium velutinum var. velutinum), and early saxifrage (Saxifraga virginiensis) are still the only native flowering plants that we could find. I was hoping that some of the grasses would have grown enough for me to identify yet. I did turn my attention to the little yellow violets that grow commonly around the preserve. I have concluded that violets are just plain evil. Yes, evil. In plant identification circles, you often hear people talking about how difficult things like grasses, sedges and willows are to identify. Well, I think violets are worse. With the others they are difficult, but the taxonomy is pretty much agreed upon by the plant taxonomy gods above. Violets are surprisingly difficult and there is very little agreement on their taxonomy. I have a number of flora text available to me both printed and on the internet. None of them employ the same taxonomy for Violaceae. An this little yellow violet is a poster child that illustrates the problem. After several hours of trying to reconcile the differences I finally figured it all out. The little yellow violet that I see at the Stroud Preserve is Viola pubescens var. scabriuscula in Rhoads and Block. The key stresses the features of V. pubescens var. pubescens, which is where I went wrong. In Weakley, the little yellow violet is indeed V. pensyvanica. Both Rhoads and Block and Weakley give V. eriocarpon as a synonym. So, the common bond between the two authorities that I use is V. eriocarpon. And birders think flycatchers are difficult. Please. Barn Swallow – approximately 20, many collecting nesting material from muddy area in bed of old farm pond. Savannah Sparrow – 6, one was a distinctively different from the other Savannah Sparrows that I have seen at the preserve. This one seemed larger, and overall much deeper brown. The streaking on the beast was very well defined and the supercillium was very bold and a creamy yellow from front to back. Eastern Meadowlark – at least 2, the singing male at the corner of Creek and Strasburg Road still present. It can often be seen singing from the telephone wire just to the west of the intersection. Large field mouse-ear chickweed Cerastium velutium var. velutinum Raf. 23 April 2013, Stroud Preserve, West Chester, Chester County, Pennsylvania. With all the reports of various and sundry spring migrants from our area from the PABirds listserver, I headed out today with high hopes of seeing some newly arrived spring warblers. Instead, all the highlights of the day seem to be birds of a more wintery nature. The biggest surprise of the day was a single flyover Red Crossbill! A few days ago I was thinking about making a post to this blog about my disappointment in not seeing any of the good winter finches that had invaded the Delaware Valley. Crossbills, Redpolls, and Grosbeaks seemed to be everywhere, except the Stroud Preserve. At about noon today, as I had my nose pointed up searching for movement I in the trees that could turn in to a bright spring warbler, I heard a familiar “kip-kip-kip-kip!” In my experience whenever I hear their call in flight, I only actually see the bird in flight one out of ten times. So, I frantically searched the skies overhead and saw the bird flying due east. It didn’t land of course and kept on going until it was well out of sight. Earlier In the day I had an absolutely awesome look at a Merlin perched in the big sycamore tree in front of the old barn. Most of the Merlins that I see are flyovers. This one let me walk directly under it and check it out from all angles. The other winter surprise was a Winter Wren. I thought these were all gone as the last one that I saw was way back on March 21st. Otherwise, there were no new spring migrants. All in all, it was a pretty slow day for mid April. It was pretty chilly as well! There were good numbers of Yellow-rumped Warblers along the Brandywine with a few Palm Warblers mixed in. White-throated Sparrows were still congregated around the serpentine outcrop. Lyre-leaved rockcress Arabis lytata L. 23 April 2013, Stroud Preserve, West Chester, Chester County, Pennsylvania. Early saxifrage Saxifraga virginiensis Michx. 23 April 2013, Stroud Preserve, West Chester, Chester County, Pennsylvania. The serpentine outcrop had a few blooming specialties. Lyre-leaved rockcress (Arabis lyrata), large field mouse-eared chickweed (Cerastium velutinum var. 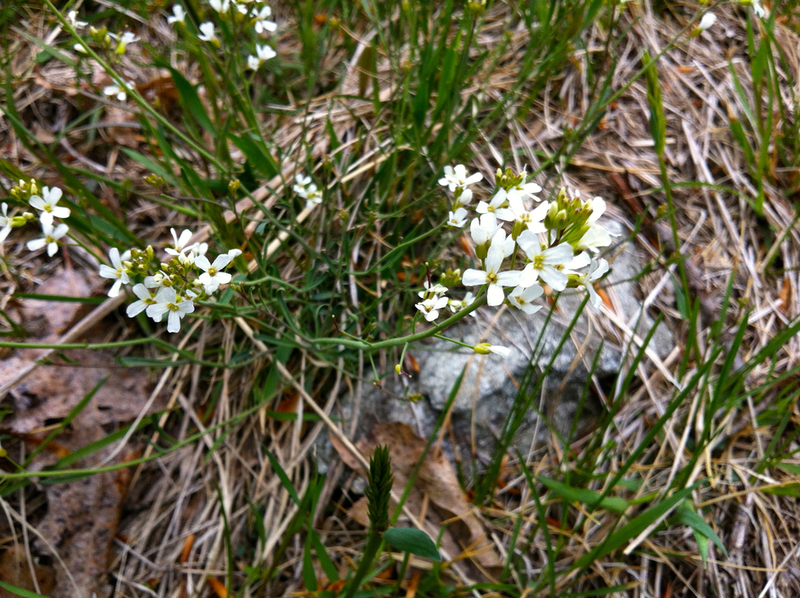 velutinum), and early saxifrage (Saxifraga virginiensis). I have found these three species only on the serpentine outcrop and no where else on the preserve. Merlin – 1, FOY, only the second time that I have seen one perched in the preserve, as most are flyovers. Winter Wren – 1, I thought I was done with these little guys! Blue-gray Gnatcatcher – approximately 30, these seemed to be calling from every group of trees I encountered today. Yellow-rumped Warbler – approximately 40, only along the Brandywine. Palm Warbler – 5, only along the Brandywine. White-throated Sparrow – approximately 75, as with my last visit, many were found in the area of the Serpentine outcrop. Eastern Meadowlark – 3, two calling in the area of the Bobolink field. 1 calling near the intersection of Creek and Strasberg Roads. The one along creek road seems to be the only one singing in a sustained way as if defending a territory. Red Crossbill – 1, Bird of the Day! A new bird for the preserve list. A complete and total surprise!